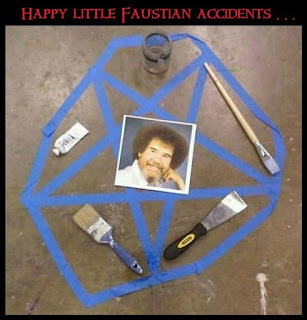 Bob Ross has long been part of the cultural memory in the USA because of his painting tutorial shows and videos. He was such a kind-hearted individual and it came across in all he did and said. As such, he is naturally someone folks like to juxtapose for the sake of humor, much as the do with Mister (Fred) Rogers, Bob Newhart, and other quietly pleasant people. I snagged a meme from the Intrawebs to illustrate the point. Enjoy! Also, I saw a Bob Ross meme floating around and felt compelled to adjust it a bit. Finally, a funny video dropping Bob Ross into the action of The Revenant was uploaded to the Above Average YouTube channel last month.